Mattie has a problem. It turns out her crush on a boy, Elijah, isn’t going very well because he seems more interested in video games than her. And she’s helping the star of her school’s production of Romeo and Juliet learn his lines and getting flack from some girl who has a crush on him— meanwhile, she’s becoming friends with Gemma, the smart, funny, beautiful and, most importantly, british girl who is playing Juliet. It’s causing her friends some grief when they think that she’s abandoning them for the popular crowd that seems to have claimed Gemma, but Mattie isn’t even sure if she just likes Gemma, or like likes Gemma. This book successfully navigates the hierarchies of middle school, incorporating Shakespeare and keeping cool around your crush like a pro. Mattie’s relationship with her friends, her family and her blossoming friendship with Gemma all contributed to making this book memorable for me. While Gemma seemed cool, almost impossibly so, Mattie is grounded with quirks and a penchant for getting easily flustered. But Gemma’s charm also means she’s polite to the point of being railroaded when she doesn’t necessarily want to always go along with the cool crowd. While I wanted more of a denouement at the end, I can honestly say this is one of the sweetest books I’ve ever read. I haven’t read any love stories about twelve-year-olds which I can compare this too, but if you find any queer middle-grade stories, please feel free to send them my way. The book never really discusses labels, but Mattie tries to confront her feelings without destroying this new friendship she has. I was a little jealous that there wasn’t a book like this when I was younger, that didn’t present being ‘straight’ or ‘gay’ as an either/or situation, especially with supportive characters like Lucy, Cara and Mr. Torres. Otherwise there was the flash of familiarity. I know that the change from one crush to another could happen very suddenly, less often than in elementary school, at least when you remembered to have a crush on somebody, but in middle school, these things felt a little more series. Suddenly, your heart would actually beat faster and you’d be hyper aware even when you touched hands for a bare moment… And actually kissing that person? Well, I would have probably fainted. This book is absolutely appropriate for young readers. The publisher says it’s aimed at kids 9-13, and the inclusion of uplifting stories that celebrate and validate young readers who might be having questions about their sexual orientation is extremely important. While the author is straight I felt she handled the romance, the feel of the crush, wonderfully. I was dismayed to discover that she’d actually been told to stop speaking about this book at one school. She wrote about this visit in a blog post you can read at the nerdy book club. The fear of parental blacklash, of the vitriol which has become common, made the teachers actually went so far as to apologize for the book to the students. I’m so glad this book exists. 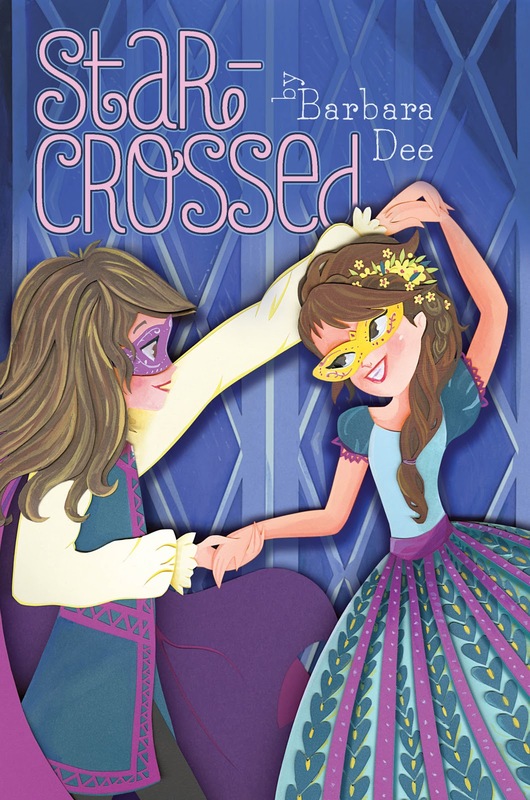 I really wish I had had a book like Star-Crossed when I was growing up. If you need a little bit of a pick me up, read about the background of this book and a brief blurb about the cover design here on nerdy book club.